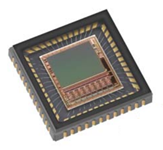 The PYTHON 1300 is a 1/2 inch SXGA CMOS image sensor with a pixel array of 1280 by 1024 pixels. The high sensitivity 4.8 µm x 4.8 µm pixels support low noise “pipelined” and “triggered” global shutter readout modes. Furthermore the correlated double sampling (CDS) support in global shutter mode results in reduced noise and increased dynamic range. The sensor has on-chip programmable gain amplifiers and 10-bit A/D converters. The integration time and gain parameters can be reconfigured without any visible image artifact. Optionally the on-chip automatic exposure control loop (AEC) controls these parameters dynamically. The image’s black level is either calibrated automatically or can be adjusted by adding a user programmable offset. A high level of programmability using a four wire serial peripheral interface enables the user to read out specific regions of interest. Up to 8 regions can be programmed, achieving even higher frame rates. The P1-SN/SE part variants have 4 LVDS lanes, facilitating frame rates up to 210 frames per second in Zero ROT mode. Each channel runs at 720 Mbps. A separate synchronization channel containing payload information is provided to facilitate the image reconstruction at the receiving end. The P2-SN/SE part variants provide a parallel CMOS output interface at reduced frame rate. The PYTHON 1300 is packaged in a 48-pin LCC package and is available in a monochrome and color version. Contact your local ON Semiconductor office for more information.